I started playing Battleborn during the open beta. I enjoyed the game but it got boring since there was only the one level. I grabbed it recently from Amazon when it was on sale for $11. I have enjoyed playing it again. I like that they added a story mode to it and that there are more levels for the multiplayer. I am looking forward to actually playing the story mode with a friend, but the match making is good. 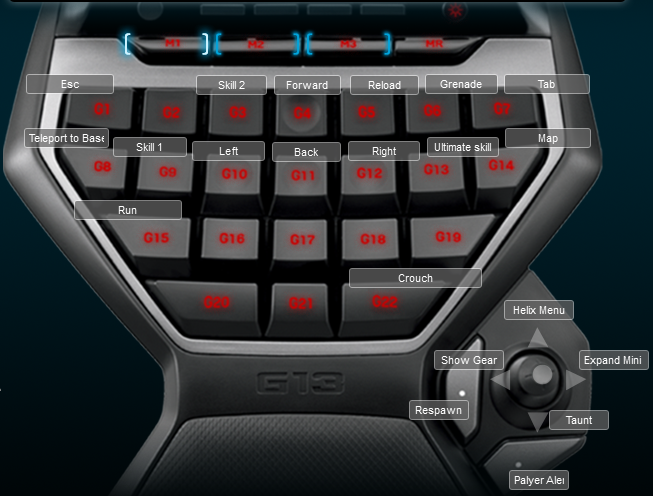 I didn’t check if the game had a Logitech G13 because at this point I just make my own because I have yet to like one default profiel for a game. The game is a pretty typical FPS but it has a few things like upgrades that need extra buttons. Plus you have multiple melee attacks. I put the second melee on my mouse. Below is a screenshot of the keyboard layout.